All of our CLEAN3 Systems offer Dual Ceiling Systems. Our dual ceilings significantly reduce the effort required for air balancing, duct work, HVAC systems and daily cleaning. Further, we offer Cleanroom walkable ceilings or non-walkable ceilings, and T-Grid profile false ceilings. 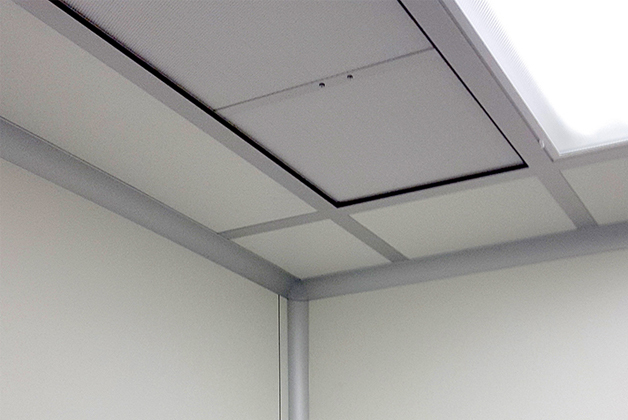 The walk on panels are the highest rated ceiling panels in the industry at 25 lb/ft2. We offer three insulation options: Polystyrene (for noise), Rock Wool (for increased thermo-barrier and fire resistance) or corrugated aluminum. Our Exterior Ceiling System uses the same panels as our wall system and a tightly sealed outer ceiling. Our flexible Exterior Ceiling System is easy to assemble and offers excellent resistance to humidity transfer. Our Interior Ceiling System consists of either a T-grid structure made of an aluminum profile or the same ceiling system described above. supporting the lights and HEPA filter units. © WWW.CLEAN-CUBED.COM, All Right Reserved 2016.